Teacher Ben Gunty describes how to find supporting evidence in texts during a freshman multicultural studies class at the original Noble Street campus in West Town. The school routinely posts some of the best metrics in Noble’s portfolio, including high retention for students and teachers, low expulsion rates and high performance on the ACT. When Michael and Tonya Milkie opened their first school on Noble Street back in 1999, they were just two teachers trying out a new idea. Charter schools then were under-the-radar experiments that had little impact on the rest of Chicago Public Schools. 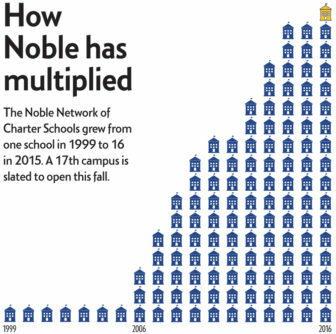 But in 2006, Noble began adding campuses and started down a path that would eventually make it the largest and most controversial charter network in the city. 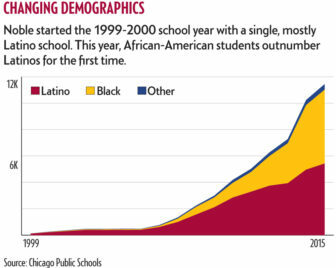 Today, one out of every 10 public high school students in Chicago is getting a Noble education. Four of Noble’s 16 campuses are still adding grades. A 17th school, approved last fall despite unprecedented public opposition, opens later this year. And later this month, Noble officials plan to ask for even more schools. While most Noble campuses are highly rated by CPS, some newer ones lag behind. These sites reflect the network’s move into more troubled and deeply impoverished African-American neighborhoods on the South and West sides, where students come in with more challenges. As Noble’s student body has come to more closely resemble the district’s, its leaders admit their hallmark focus on consistent behavioral and academic expectations has needed adjustments. But they insist they haven’t changed their priorities: attracting top educators and promoting a disciplined school climate that allows for learning without distractions. No bells and whistles. Critics often imagine the Noble Network of Charter Schools as a monolith that steals “good” students from neighborhood schools and pushes out the “bad” ones. A place where students walk silently in hallways and teachers are obsessed with test prep. There is some truth to that stereotype, as higher-achieving students are more likely to choose Noble to start with, while many who can’t handle the strict system of demerits leave. But multiple campus visits and interviews with dozens of teachers, students and parents show a more complicated reality. Principals have great freedom to shape their schools’ educational programs and operations. They decide whom to hire, whether to mandate extra ACT practice tests and what programs to implement. That is why one campus can have a social justice and arts focus while another is modeled after an East Coast private boarding school. Christopher Goins, the founding principal of the Butler campus in Pullman, says that during his employment interview, he was asked what type of school he’d like to open. Then there are the differences that geography dictates. Noble campuses in poor, predominantly black neighborhoods struggle with recruitment, academics and gun violence. Three mostly black campuses that have finished adding grades are under-enrolled. Noble officials say that’s because they can’t max out enrollment due to physical constraints in some buildings. In addition, newer campuses haven’t yet developed the brand recognition or alumni networks that cycle in siblings, cousins and friends. Neighborhood high schools fare much worse, with more than a dozen at less than one-third capacity, according to a CPS formula that does not always adequately reflect how schools use classrooms. But unlike most neighborhood schools, the Noble network is able to pay for extra help — such as full-time recruitment officers — at struggling campuses. It can afford to provide extra services because it pays teachers less and has significant outside funding. Geography poses other challenges. CPS data show that Noble’s centrally located campuses attract students from across the city. But students are less likely to travel long distances to the South and West side campuses, limiting recruitment. For example, more than 80 percent of students at the downtown Muchin campus travel at least 5 miles. But fewer than a quarter of students at Noble’s six mostly black campuses travel that far. There’s an obvious reason for the longer commutes: safety. Noble isn’t immune to the violence that’s traumatized some neighborhood high schools. Since last school year, five of the network’s South Side schools have lost at least one student to gun violence. 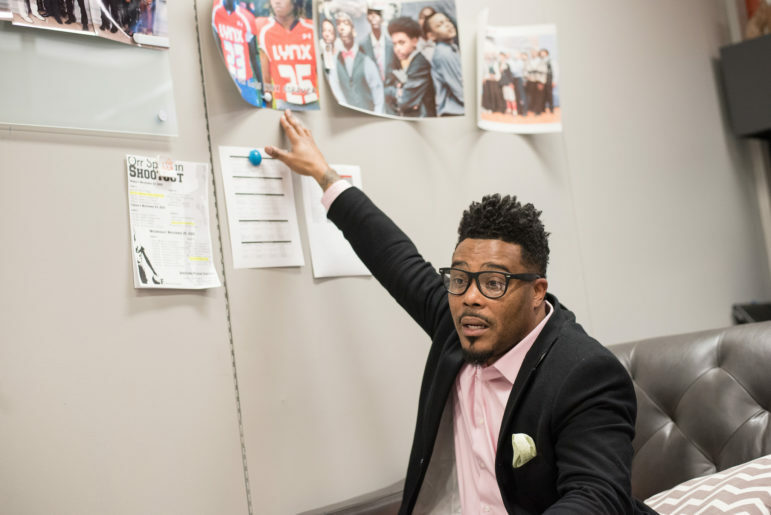 After two of his students were killed last year in separate shootings — one accidental — Butler’s principal altered the school’s schedule to hold a town hall meeting and give students time to mourn. Noble officials acknowledge that students at some campuses face more trauma in their lives. Several teachers told Catalyst they’d like to see the network offer less punitive restorative justice alternatives for students, especially those with stressful home environments. “Everything is very black and white,” one teacher said. And lawyers, advocates and parents say Noble fails to adequately adjust its discipline policies for its growing number of students with special needs. Diana Arroyo has a 14-year-old son with an Individualized Education Program (IEP) who attends the Speer campus in Belmont Cragin. She says he received multiple detentions for behavior related to his Attention Deficit Hyperactivity Disorder, such as not paying attention, leaving his seat and not maintaining eye contact with the teacher. Network officials deny trying to push out students with special needs and point to the rising number of students with IEPs across the network as evidence that families believe they are delivering appropriate services. Still, suspension and expulsion rates tend to be higher at Noble campuses with higher proportions of black students and those with special needs, state and district data show. These kinds of disparities aren’t unique to Noble, but charter schools have gotten extra scrutiny because they’re allowed to expel students for lesser offenses than district-run schools can. 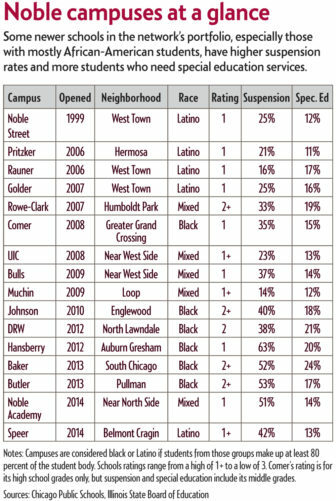 Noble’s mostly black campuses also post the highest student attrition rates, which are directly related to discipline, as students with high numbers of detentions are required to repeat the school year. Teachers say many students decide instead to transfer to a neighborhood high school and move on to the next grade. The new grace period came about a year after the network announced it would stop charging students $5 per detention, a practice that met with strong opposition both inside and outside the network. In addition, there have been revisions to school-level rules that some inside Noble viewed as culturally insensitive. For example, one principal prohibited certain hairstyles, including some types of braids. During internal meetings, black principals elsewhere in the network protested, saying the rule discriminated against black girls. Eventually it was dropped. More established campuses, which tend to serve mostly Latino students, are better at maintaining a consistent disciplinary structure. That’s in part because they have more teachers who are familiar with the rules and experienced with classroom management. To maintain consistency across campuses, the network now employs two full-time auditors who visit schools to check on “school culture” issues, such as dress code compliance and cleanliness. Margelees Cerdo left Noble’s Bulls campus in the middle of her sophomore year, saying she was too stressed out by the network’s strict discipline policy. She also questioned the value of giving demerits for chewing gum. 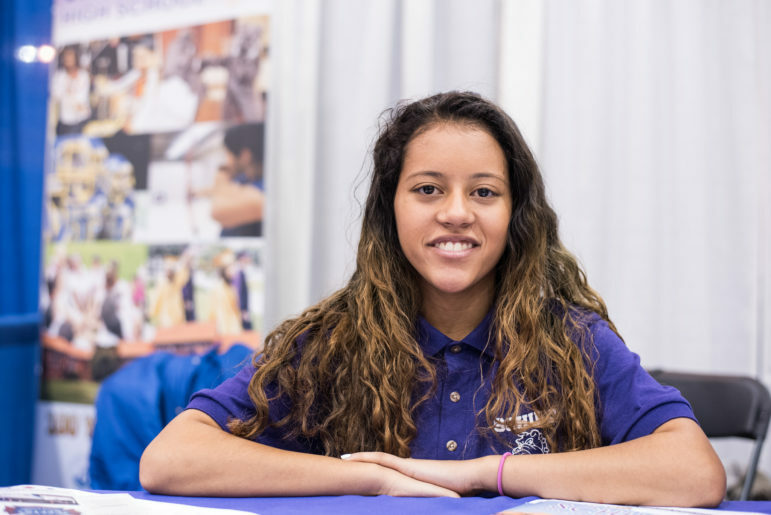 Cerda is now a junior in the International Baccalaureate program at Schurz High School, which she promoted during a high school fair last November. Many students say they tolerate Noble’s discipline policy because of the network’s strong track record of getting students into college. The promise of college is tied to an intense focus on the ACT entrance exam, which many students and teachers find stressful. Network officials say strong ACT prep is important because it sets students up for the best possible college options. The higher students score, the more likely they will be admitted into prestigious colleges with higher graduation rates. But many teachers find the competitive framework around the ACT demoralizing. Teachers are constantly shown how their students stack up on in-house interim ACT assessments, compared with students at other campuses. Some bonuses are tied to these metrics. One former teacher from the DRW campus — a struggling school Noble took over from another charter operator — described with bitterness how teachers at top-performing campuses share “best practices” during network-wide professional development meetings. Average composite scores on ACT-Explore tests given at the start of freshman year ranged from 14.2 at the Rowe-Clark campus in Humboldt Park to 16.1 at the UIC campus, according to the most recent CPS data, when Noble had just 12 campuses. The district average was 15. It’s hard to pinpoint how much “value” Noble adds to its student performance, compared to other schools, because so many students transfer in and out of all types of schools each year. However, district data that do not account for transfers show that, on average, Noble campuses raise their students’ ACT scores significantly more than most other schools. 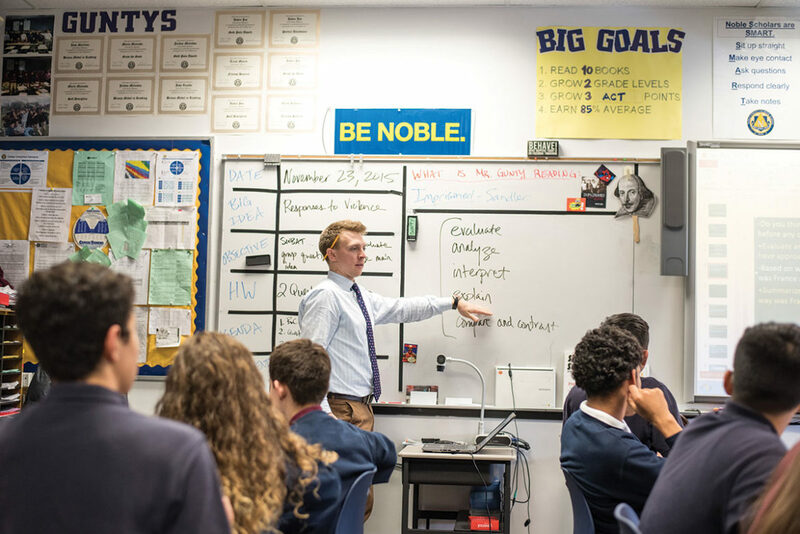 In mid-November at Baker College Prep, English teacher Jennifer Wright co-teaches a lesson to 9th- and 10-graders practicing “comma rules and sentence patterns in ACT style passages.” After reviewing questions on paper, students divide into two teams. Using handheld clickers, they vote for the correct answers, vying for a no-homework prize. And as Noble’s reputation on ACT performance has spread, school leaders in 30 U.S. cities and 10 CPS neighborhood schools have asked the charter network to share its interim assessments. Noble does this free of charge. 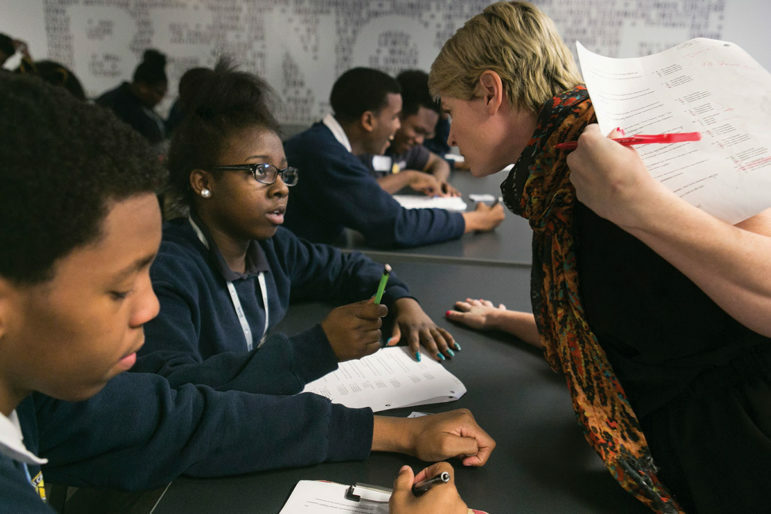 Over the years, Noble has developed one of the district’s most sophisticated programs to help get graduates into and through college — though other Chicago charters were pioneers in this realm. The network pays for multiple college visits for all students, hires an alumni outreach coordinator for each campus and has built a computer program to match students to colleges based on achievement and financial aid. Private funding helps cover the costs, including millions of dollars dedicated to scholarships for undocumented students. It’s because of all this that Noble boasts an impressive track record of sending graduates to college, even better than many of the city’s selective-enrollment schools. Noble’s focus on college is a big draw. 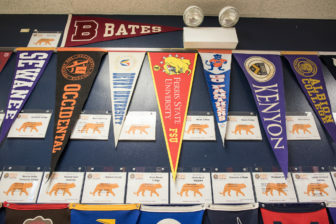 At the original campus in West Town, college pennants and a list of alumni who attend each school line the walls. But there’s a growing acknowledgement, even among members of Noble’s Board of Directors, that the network isn’t doing enough for students who may not be well-served by a traditional four-year college. The network is now hiring a career-services manager to look into vocational and two-year programs. He concedes, though, that traditional CPS high schools aren’t doing any better. Last year, teachers, principals and activists protested proposals from Noble to open new campuses, saying they threatened the viability of neighborhood schools. Never before had Noble faced so much resistance to its expansion. There seems to be no end to the number of rich and powerful donors who want to support the network. Both Gov. Bruce Rauner and CPS Board of Education President Frank Clark have schools named after them — naming rights cost around $1 million to $2 million. 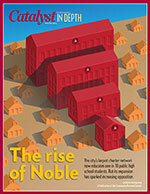 Noble’s private fundraising sets it apart from other large charter school networks in Chicago. Records show that in recent years, Noble has raised more private dollars than any other charter network in the district — amounting to about 10 percent of its overall operating revenues. Campus-level giving pays for computers, extra social workers and even group therapy for teachers. There is federal support, as well. Over the past five years, Noble has received $19 million in federal grants to support expansion, including $8 million last fall. Critics who question the need for more schools in a time of districtwide declining enrollment saw it as an unnecessary parting gift from outgoing Secretary of Education Arne Duncan, who oversaw Noble’s early expansion when he was the district’s CEO a decade ago. All the extra outside money will make it easy for Noble to cover the costs of building its new campus in Brighton Park. And if it needs more, it has tens of millions of cash in hand, plus a stable credit rating for future borrowing. Eventually, Milkie says, he’d like to see 15,000 to 20,000 CPS students receiving a Noble education. There are differing views inside the network about how to get to that target. Some point to the fact Noble already educates more than 11,000 students. By filling the maximum capacity at all existing campuses — which would require some renovations — and opening the Brighton Park campus, Noble would surpass the lower end of Milkie’s desired range. But Milkie favors opening more schools, and the network proposed eight more in its most recent federal grant application. As of press time, district officials were offering to cap charter school growth as part of labor negotiations with the Chicago Teachers Union. If that happens, Noble could open new campuses only if other charters shut down. For now, Noble plans to file paperwork later this month to ask CPS for additional campuses, and Milkie is prepared for more public criticism. Chicago is now the most heavily unionized charter school system in the nation. And for the second time in a year, charter teachers threatened to go on strike. That’s certainly not the direction Gov. Bruce Rauner and Mayor Rahm Emanuel thought they were headed a few years ago.